That song is on repeat in my mind during the summer. I’m not too sure Sublime’s songs (in case you haven’t guess yet), are really appropriate summer ballads accompanying my kids photos, but it might be a step up from ‘rain makes corn, corn makes whiskey…’ (thank you Luke Bryan for that infectious little diddy) that they sang all last summer. This is my entry for Love that Shots theme Splish Splash! 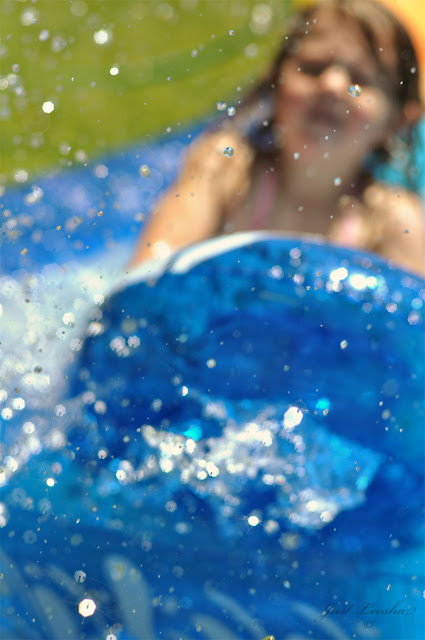 She isn’t in focus, but it was still my favorite photo of my oldest cruising down the slide into the pool the other day. It’s the water drop bokeh that got me. The water droplets are awesome. Great shot, Leesha!